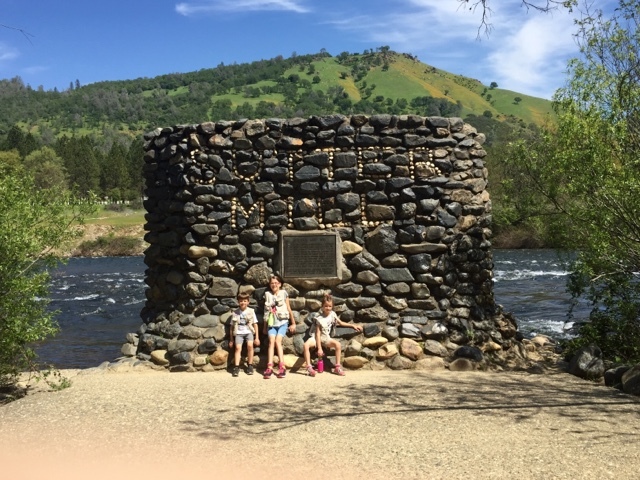 This weekend we decided to take the kids to explore a little bit more "Gold Country" in Northern California. 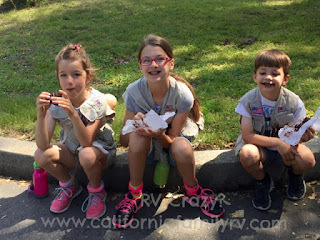 We drove to the Marshall Gold Discovery State Historic Park in Coloma, California. The drive was beautiful this time of year. We saw rolling green hills speckled with orange poppies and other wildflowers. We are so thankful for all of the rain this winter! When we arrived in Coloma, we parked at the North Beach parking lot (state park fee was $8). There was ample parking for both cars and RV's. Much of it was shaded. There are also extremely clean restrooms here with flush toilets. Well worth the minimum park fee. A short walk through the shaded park leads you to the visitor center and replica of James W. Marshall's sawmill. We were all excited to see this, and stretched our legs a little while checking out the mill. Pretty impressive! My husband and I had chosen the Monroe Ridge Trail to try out today. It was about 3 miles long, and listed as moderate. We were all able to complete it easily with our youngest (very ACTIVE five year old) running nearly the whole way. Before reaching the trailhead, we found a dark (and creepy, in my opinion) abandoned miner's shack. The kids were very eager to use the flashlights they had packed to explore it! Thankfully (for me) they emerged quickly from the dark, spider-web filled old shack, and we continued to the trailhead. Four of us were excited for the hike, but one of us began complaining of foot pain just as we found the trail-head! 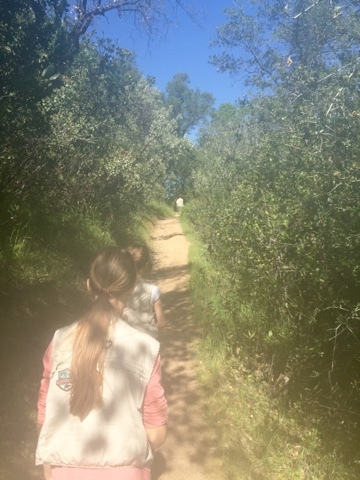 With three kids, it's almost inevitable that someone will have to go potty, be hungry, or in this case, have a "hurting foot," but we soon sweet talked her into just "trying" the trail. Within minutes she was happily slurping on fresh orange slices, and pointing out every.single.wildflower. on the trail. So back to her normal sweet self. Whew! Parenting score! One of the many gorgeous wildflowers we admired along the trail. The trail was labeled "moderate" and there were several uphill climbs. But we loved that it was nicely shaded. I would say that most of the hike was in the shade, yet even at about 11 am, it was starting to get warm. So make sure to check the weather before your trip, and we all recommend wearing layers for this one! Also make sure to pack plenty of water. You can really see the incline in this photo below. So if hills bother you, you will NOT like this hike. Another perk of this hike is that the uphill portion of the hike is the first half. You will be moving downhill for the middle and end of the hike. It's a really nice cooldown (especially for the kids) after the invigorating uphill climb. And with most uphill hikes, the view at the top was spectacular! About half-way through the hike, you are treated to this bird's-eye view of the American river flowing below. It was very pretty! After admiring the view (and catching our breath) for a few minutes, we headed back to the trail. Cool wooden steps and platform help with an especially steep portion of the hike. We also noticed deep trenches cut into the dirt alongside the hike in certain places. We guessed that these had to do with the mining process. After our hike, we learned that these were, "mining ditches" used carry the huge amount of water the miners used. So keep an eye out for the ditches. They were really cool to see! 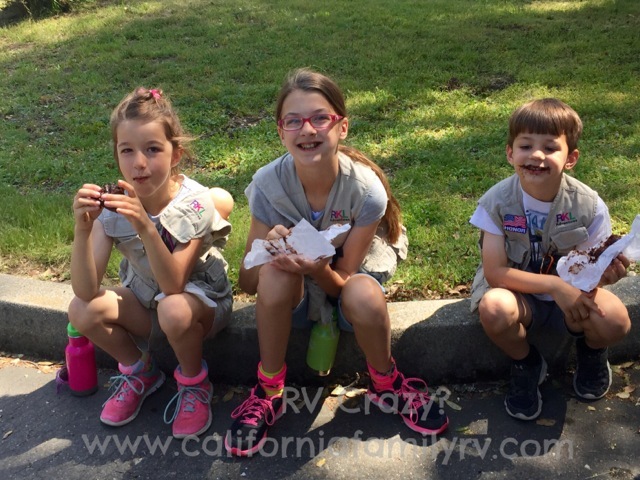 We make sure to pack ample food and water for the hike, but we allow our kids to pack their own "essentials." Our little girl almost always packs her baby doll and faithfully carries her for the entire hike. We like giving them the freedom to choose what they will pack. Our only rule is if they bring it (hat, sunglasses, toy etc.) they will carry it themselves. It's worked really well so far! Just a little past the half-way mark, there is a very nice shaded picnic area, complete with tables! We preferred to sit in the very shaded forest area on boulders, but either option was great. The lunch area overlooked this beautiful meadow dotted with wildflowers. Fluttery, colorful butterflies floated in and out of the meadow. It was a lovely sight! We enjoyed sandwiches fruit and chips we'd packed. Re-fueled and re-energized, we hit the path again! And before we knew it, we had proudly reached the end! This Sutter Mill stonework was an awesome place to rest after a long, warm hike. The rushing river, and cool breeze blowing off of it was extremely refreshing. Aside from the gold, I can see why people would settle here!